Casual in Arizona and the seventh known record for Pinal Co. The most recent was 7/15/13 in Superior. Bird was feeding in flooded alfalfa field on east side of Stanfield Rd. 0.5 mi n. of Barnes Rd. Feeding with large flocks of Cattle Egrets, Long-billed Curlews, and White-faced Ibis. Unmistakable large pink water birds with a spatulate bill. This is a first year bird because of the fully feathered head. 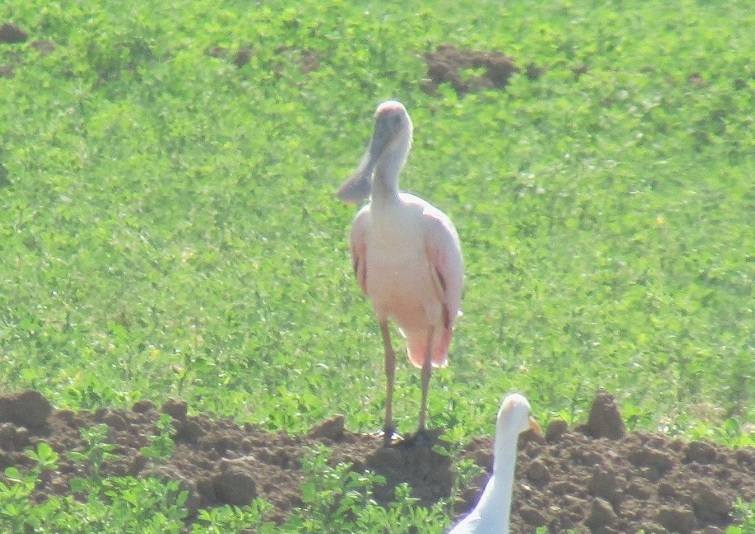 Second year birds also lack the red shoulders of adults, but have the bald forehead typical of adults and are usually brighter pink. Adult plumage is acquired in the third year.